In yesterday's 1985 post, we saw INXS debut at number 5 with "What You Need", the lead single from their Listen Like Thieves album. Almost exactly five years later, they were at it again. This week in 1990, the band debuted inside the top 10 with the first release from their seventh studio album. As we'll see, that wasn't the only similarity between two of the band's best known singles. On top of the chart this week in 1990, the song that would end up denying INXS a second chart-topper started its reign at number 1. Jon Bon Jovi knocked Faith No More off the top spot with "Blaze Of Glory", which began a six-week stretch at the summit. Australia had been one of the only countries to take to the Talking Heads member's previous solo album, but this lead single from Walk On Water didn't repeat the success of "Rev It Up". A third brief chart run for a track from the Fear Of A Black Planet album for Chuck D, Flavor Flav et al, who were still very much a niche band in Australia. In 1989, they jumped on the Batman bandwagon, so it was only logical that in 1990, Teenage Mutant Ninja Turtles would inspire the Australian act's second top 100 appearance. So obscure it doesn't appear on YouTube. He'd fronted one of my favourite Australian synthpop bands in the '80s, but the former Kids In The Kitchen singer had obviously been listening to a lot of Madchester records before releasing his debut solo single. What can I tell you about this song? Not a lot, actually, since it missed the top 100 completely and also didn't chart in the UK, where four-piece Conspiracy are from. The first of two singles the band released, "Everytime You Leave", which I've never heard before, sounds kind of like "Love Changes (Everything)" by Climie Fisher meets John Waites' "Missing You" - without being as good as either. Also not great: the band's mission statement, according to the ad at the bottom of the chart. "Conspiracy is the union of musical forces in the spirit of subversion." OK, then. One of the worst follow-up singles of all time, this cover of the 1971 song by The Chi-Lites was probably about the last thing anyone would have been expecting from the man who was still at number 7 with "U Can't Touch This". A slow groove track that sounded more than a little like Milli Vanilli's "Girl I'm Gonna Miss You", "Have You Seen Her" was the second single from Please Hammer Don't Hurt 'Em and at least made sense in the US and the UK where the original recording had been a number 3 hit. Thankfully, the rapper born Stanley Burrell had something much better up his sleeve for his next release. Six songs into her record-breaking run of singles from Rhythm Nation 1814 and Janet Jackson had still to score a top 10 hit from the album in Australia (compared to the five she'd already racked up in the US). And it looked like the self-penned "Black Cat" wasn't about to change that when it debuted in the 70s back at the end of July. Slowly but surely, the only single released from the album not produced by Jimmy Jam and Terry Lewis made its way up the listings, eventually reaching the top 10 in November. While some of the album's previous singles had been a bit too R&B for Australia at that point in time, the harder stylings of "Black Cat" were perfect for a market that still preferred rock music over all else. The genre jump also went down well in the US, where "Black Cat" became Janet's fourth number 1 single and earnt her a Grammy nomination for Best Female Rock Vocal Performance - one of a record-breaking five genres in which Janet has been recognised. The Melbourne comedy troupe joked their way into the top 20 in 1989 with previous single "Five In A Row", so it was kind of inevitable there'd be a sequel. This time, INXS (too try-hard), Dragon (too fat), Daryl Braithwaite (too old), Kate Ceberano (too curvaceous) and Midnight Oil (too political) were the objects of some particularly nasty derision. Despite getting their timing spot-on for a joke at INXS's expense, very little else worked for The D-Generation this time around - and "Five More In A Row" was a resounding flop. Even so, in between this single and the series of Fast Forward parodies that aired through the year, 1990 was a tough time to be a pop act in Australia. Following up Kick was never going to be easy. If 1985's The Swing had opened the door for the band internationally, Kick set it flying off its hinges as single after single climbed charts around the world. In Australia, it may not have reached number 1 on the albums chart but it did spend 11 non-consecutive weeks at number 2 and 71 weeks in the top 50, yielding four top 20 hits and selling around half-a-million copies in the process. 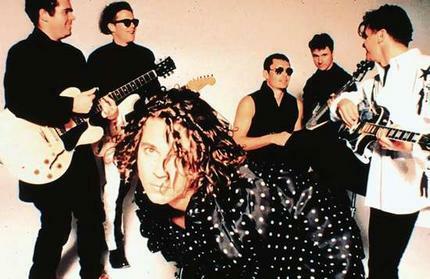 After taking 1989 off - during which time singer Michael Hutchence scored another top 10 hit with side-project Max Q and started dating Kylie Minogue - the band reconvened to record X, with the Roman numeral signifying the band's 10th year releasing music (as opposed to when Kylie used it as the title of her 10th album). The lead single from X also had a link to Michael's girlfriend, who'd used the phrase "suicide blonde" to describe her bleached hair in The Delinquents. Otherwise, "Suicide Blonde" was pure INXS - a mix of rock, funk and dance with a sampled harmonica thrown in that stormed into the top 100 at number 6, just one place lower than the debut of "What You Need" five years earlier. Frustratingly, it would become their third single to peak at number 2 (following "What You Need" and "Good Times" with Jimmy Barnes), leaving "Original Sin" as the band's only chart-topper. What few probably saw coming at this stage is that "Suicide Blonde" would also be INXS's last top 10 single during the lifespan of the original line-up. 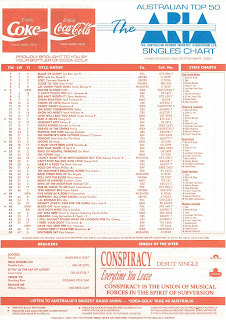 As we'll see when second single "Disappear" appears on the chart before the end of the year, things took a sudden turn for the once-unstoppable band. Next week: a soundtrack hit that took four months to reach the top 50, a return to form for an Australian band that'd disappointed with their previous couple of singles and the second release from a future reality show judge. Don't think I've ever heard the Jerry Harrison track. As for Public Enemy being a niche act, I remember seeing a younger kid at my (relatively small) primary school wearing a Public Enemy t-shirt in 1990, to my amazement (I only knew of them at the time through seeing a clip or two on rage). Pretty sure I've never heard 'Do the Turtle Thing'. The Scott Carne song was rather underwhelming, and too similar (well I thought so at the time) lyrically to 'All I Wanna Do Is Make Love To You'. The follow-up, 'Freedom', would have made a much better debut solo single. I've never heard of Conspiracy either. 'Have You Seen Her' was indeed a bizarre follow-up idea to 'U Can't Touch This'. Had the latter not been such a huge hit, no doubt this one wouldn't have charted at all here. The backing track even sounds a bit like NKOTB's 'Please Don't Go Girl'. Instant way to lose any 'rap' credibility. I liked it at the time, but in retrospect, I think 'Black Cat' is one of Janet's weakest singles from this era. I loved the "strange relationship with Jason Donovan's ex" and "wish I could dance in the stupid bike pants but it's hard enough to even walk" lines/images from the video in 'Five More In a Row' song/video, but the other bits weren't as funny. I found 'Suicide Blonde' a bit underwhelming back then, but it's held up well over time. The intro until the first verse kicks in is brilliant. Sampling harmonica was becoming a mini-trend around this time, with Bananarama's 'Only Your Love' doing the same. Hard to believe that it would be the last top 10 hit locally. I was onto Janet Jackson as soon as 'Miss You Much' was released. I remember requested it at my Year 12 formal in Sept 1989 before it charted. It was a pity Australia missed out on the Rhythm Nation single as well as 'It's Alright'. When Black Cat came out, I was over the moon. As far as I was concerned it's on par with all the other singles released, bar perhaps perhaps the later singles like 'State of the World' and 'Come Back to Me'.